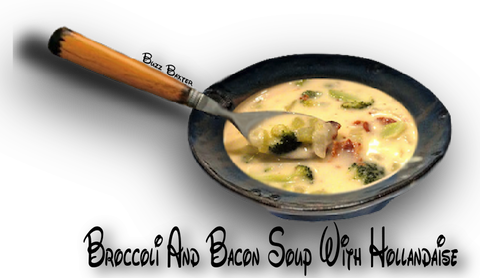 BROCCOLI-BACON SOUP WITH A SECRET INGREDIENT. I just added some Hollandaise sauce to my favorite winter soup and now it is really my favorite. 1. Boil broccoli in the chicken stock in a 2 quart saucepan until fork tender. in a blender,  OR Use an immersion blender and blend the hot soup in the sauce pan. Blend to a texture for your tastes. 3. Add salt,  pepper,  and thyme. 4. Add bacon,  heavy cream and simmer until the soup thickens. 5   Serve with crusty toasted French,  Pugalese or Asiago bread. 1. Ordinarily I like to make my own Hollandaise sauce,  but the packaged variety works just fine here. broth or water to thin it if necessary.